Since 1992 Baja Designs has been driven to provide high quality, custom off-road equipment utilizing technical innovations backed by real world and racing experience. 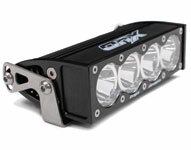 Originally the leading supplier of street-legal Dual-Sport Kits, Baja Designs has matured to become the premier supplier of off-road race lighting, as well many other bike, truck, ATV, mining, industrial and agricultural lighting products. Countless racing wins have earned Baja Designs a solid reputation in the powersports and motorsports industries as well as being selected as a supplier to the U.S. Special Forces. Baja Designs, the Scientists of Lighting, continuously bring you … bright ideas made better! © 2013 Baja Designs, Inc. All rights reserved. uService™, Stealth™, Strykr™, Onx™, Scientists of Lighting™ and the Baja Designs logos are registered trademarks of Baja Designs, Inc. 2013. 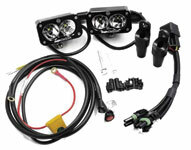 Baja Designs’ new line of adventure bike lights will amaze you and make night riding fun and safe. Each light provides an immense spread of usable lumens at a perfectly white 5000K color temperature utilizing Clearview multi-form optics designed to put the light right where you need it. Baja Designs has been a part of the Adventure bike world since 1992; our dual sport kits have given dirt bike riders the tools they’ve needed to safely take their bikes on both dirt and street for over 20 years. Each of our engineers and most employees log thousands of motorcycle miles every year. Our lights carry a LIFETIME WARRANTY and are proudly made in America. 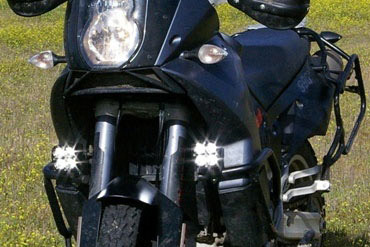 Baja Designs' Squadron LED light is the next generation of motorcycle lighting and maybe the most versatile off road motorcycle light in its class! Each Squadron exceeds HID output yet weighs only 12oz. The Squadron is a compact 3 inch x 3 inch LED light that packs 4,300 lumens. (It is about the same width and height as a post-it note) Each Squadron utilizes four CREE XM-L2 LEDs chosen from the highest quality bin at 5,000K. 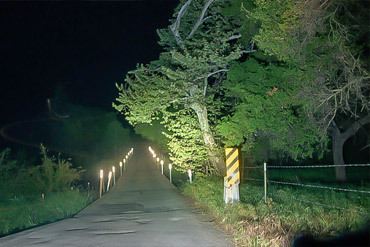 We now offer four unique light patterns including driving, spot, flood and wide-cornering, allowing for unlimited possibilities. Each pattern is easily customizable with our unique uService™ replaceable lenses and optics. Our CooperDrive™ system includes an aircraft grade aluminum housing along with an active thermal management, single layer solid copper core circuit board, which work together to maintain LED temperature within the defined operating limits and extend the overall life of the LED light. If you’re looking for the ultimate in motorcycle LED lighting technology the Baja Designs Squadron LED light is the answer! Baja Designs proves that big things can come in the smallest packages! The new Baja Designs SII Led Light offers an incredible 1800 lumens out of a tiny 3”x 2” housing; the SII is quite literally the brightest LED light ounce for ounce on the market. Our new line of Adventure bike kits provide the latest in LED technology; they are designed specifically for aggressive night-time riding by combining amazing distance projection, wide peripheral spread and a smooth light pattern. 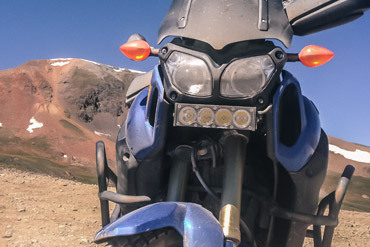 The Squadron, SII, and OnX Adventure bike kits are perfect for any adventure ride imaginable and offer OEM mount options for many Adventure bikes, including BMW, KTM, Triumph, and Suzuki. We also offer a plug and play dimmer for our Adventure Bike Kit that allows for easy dimming capability, so you don’t blind oncoming traffic while maintaining daytime conspicuity.